Laser therapy has become an integral part of chiropractic treatment. Figler Family Chiropractic is pleased to offer patients laser therapy in North Palm Beach using the Opton Pro high-power class IV laser. 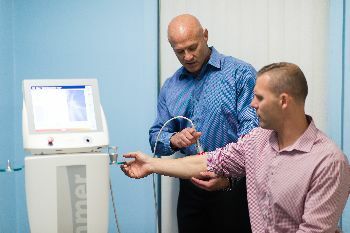 The laser is a focused light that is trained on the area of your body where you’re experiencing pain and injury. The Opton Pro’s extremely powerful laser can get deep inside your layers of tissue to provide relief and accelerated healing. Laser therapy is safe and has not prompted any reported side effects. During treatment, you are given a pair of sunglasses to shield your eyes from any light damage. While some lasers are strong enough to cut through steel, the Opton Pro’s laser will not cause pain or burn the skin. You may feel a pleasant warmth in the area, or nothing at all. These treatments also massage the muscles and can help increase blood circulation and speed healing times significantly. Laser therapy is also a useful treatment for wounds – the focused light can help regenerate tissue so the wounded area heals faster. Contact us today to get your questions answered and schedule your appointment.